Errol Morris’s quietly passionate and inspiring new film, “The B-Side,” which opens Friday, is a work of echoes and reflections. It’s a documentary portrait of Elsa Dorfman, a photographer who does mainly portraits and whose photography is inseparable from the details of her daily life. Her life and work illuminate the very essence of her medium. In the process of telling Dorfman’s life story, Morris also gathers hints about the nature of moviemaking, and about his own art. 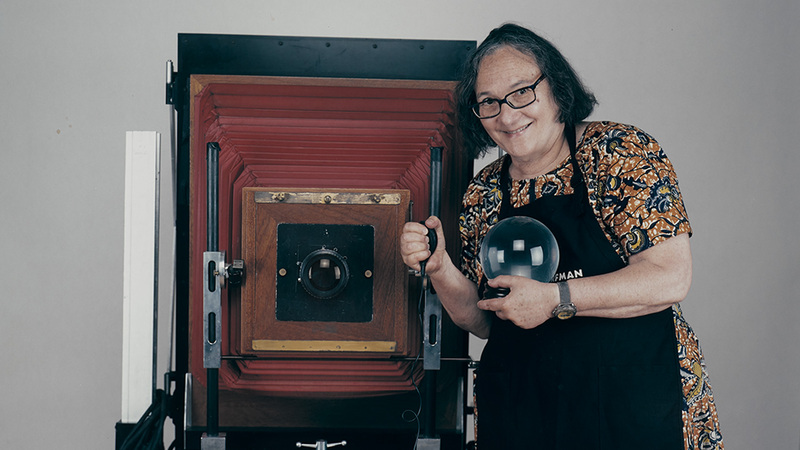 Dorfman’s photographs are shown copiously but briefly throughout the film; it is Dorfman herself—with whom Morris speaks in her studio and in her darkroom—who is the center of the film, and she’s a remarkable presence, a cinematic character whose comments distill a lifetime of wisdom, self-awareness, frustration, and survivor’s pride. The etched profundity of her phrases (spoken in an undiluted Boston accent) lingers weightily long after they’ve passed by in the calm, conversational breeze. If they were collected in a chapbook, they’d form a version of “Notes on Photography,” a companion to Robert Bresson’s aphorisms, which apply only to his own films but can enlighten any filmmaker and, for that matter, any reader. To read the rest of Richard Brody’s review click here.